iBanking App is available for Android Devices. Tap on the icon below to install it. GS&L is committed to helping you find the right mortgage product for your needs, offering a variety of products to meet your individual requirements. We make the process of securing a mortgage simple and straightforward by offering you the latest in financial tools that enable you to make sound financial choices. GS&L strives to find ways to make your banking experience convenient and secure. With iBanking you will have account access 24/7 making banking easy from home or away. Bill Pay and e-Docs features are also included. 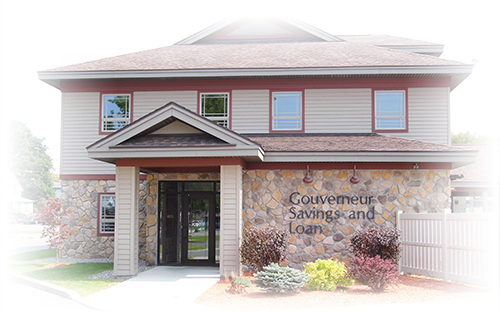 Gouverneur Savings and Loan is your hometown bank. We are your friends, family, and neighbors. We know you and want to provide you with all of your financial needs as quickly as possible in two convenient locations. That is why all of the decisions are made right here by people that understand what it is like to live, work, and play in the North Country. We are not just another financial institution we are part of your Community.